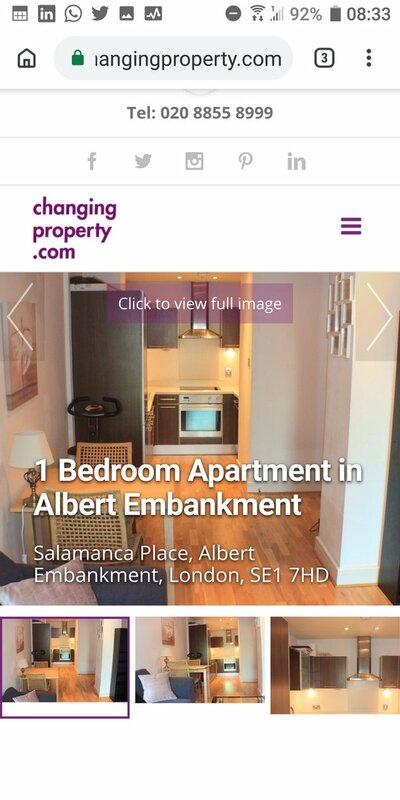 Launched in 2008, changingproperty.com is a hybrid estate agency based on The Greenwich Peninsula that bridges the gap between the high street and online agents. We offer an integrated sales, lettings, management and acquisition service across London. Whether you need to sell or let your property, or help to rent or buy your ideal home, we guarantee changingproperty.com’s personalised service will lead to a referral. With nearly 20 years experience working in the property industry and as investors ourselves in the London market changingproperty.com ultimately understands its clients’ needs and expectations. changingproperty.com presents to you: A unique and large 854 sqft one bedroom warehouse conversion that requires a quick viewing to really appreciate the abundance of space being offered. If you have a property to sell, the first step you should take is to put it up for sale. We can help you in sell your home. Click here to arrange a free, no-obligation valuation of your home or Contact us. Once we have received your instruction for valuation we will carry out a rental appraisal. We recognise the need to fulfil the rental potential of your property, and the importance of an accurate valuation in order to secure a suitable tenant, minimising delay and void periods. We operate extended viewing hours to accommodate busy modern lifestyles. Properties may be viewed during Monday-Friday 8am to 9pm and Saturday-Sunday 9am to 5pm, except national and bank holidays.